Fish, Oil & Follies, a lively and often humorous account of Loren Flagg's life-long passion for fishing, is filled with memorable events, characters, and fish tales -- some told on himself. 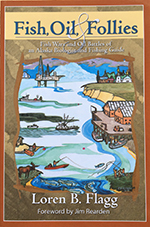 It is also an account of the most important conflict between fish and oil politics since Alaska became a state. Loren was a key player in that saga. This is the story of a man's life where avocation meets vocation in a life well lived and a story well told.